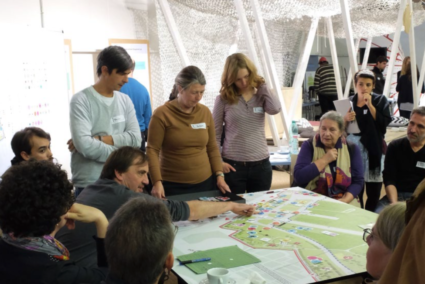 Our participation in the large-scale project THF + pursued the vision of creating a platform for future-oriented discussions around the high-spirited and much-discussed Tempelhofer Freiheit. 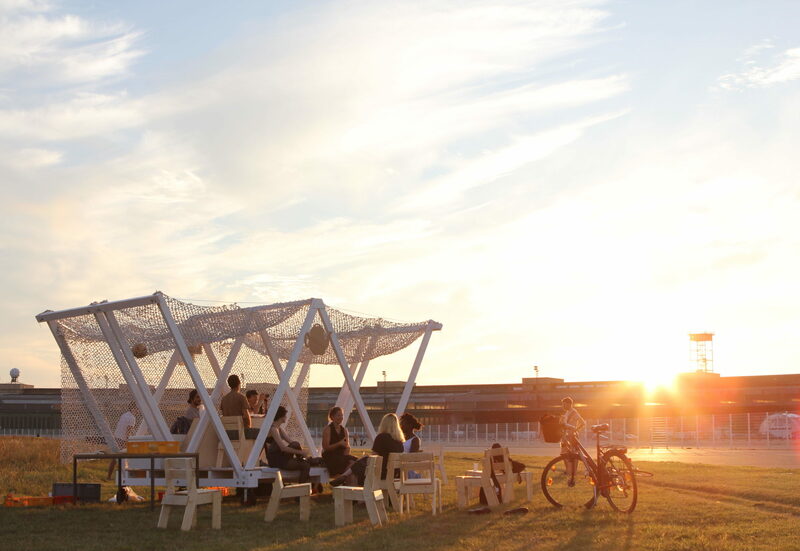 We designed and implemented a mobile pavilion, the T-house, with which alternative uses on the former airfield were to be tested. 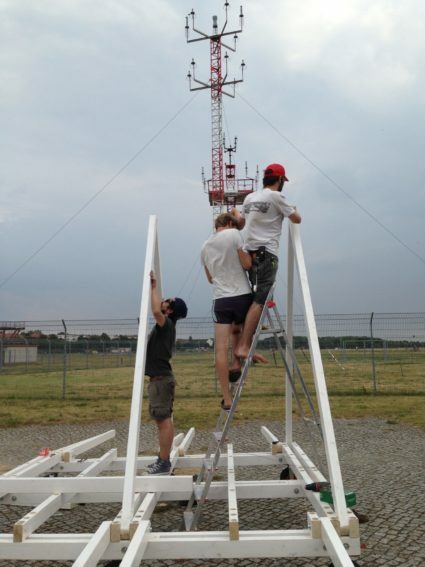 During the first workshop phase, this satellite station served as a social hub, workshop, tearoom, cinema, stage, information point and as a venue for surveys around the Tempelhofer Field. While the serving of fresh tea to the participants underlined the friendly and communicative atmosphere of the teahouse, the DIY workshop subtly questioned the quality of the infrastructure of the field and its usefulness. In the urban context, the abstraction sets a clear, artificial sign, but it doesn‘t push itself in the foreground. On the contrary especially in the open state, it blends with the horizon. In this way, it offers itself to a large number of actors as an experimental room without imposing rules or limits on them. 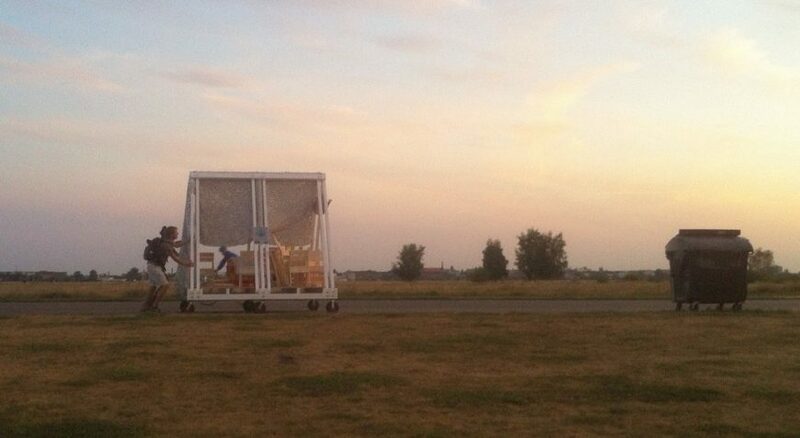 This is the freedom we want and want to preserve for the Tempelhofer field and to preserve it through our project. 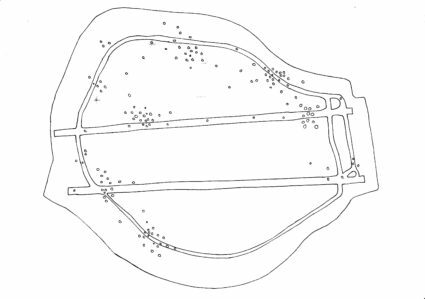 The architectonic design of the teahouse enables the simultaneity of these different privacies on the one hand and the metamorphosis of the compact, mobile object to an open plateau with a covered exterior space on the other hand. In closed mode, the house presents itself in the strong form of an extruded triangle, which is rolled like an exclamation mark through the public space. Arrived at the location the rigid form unfolds into a translucent roof that describes a more private area just by its light shadow throw. 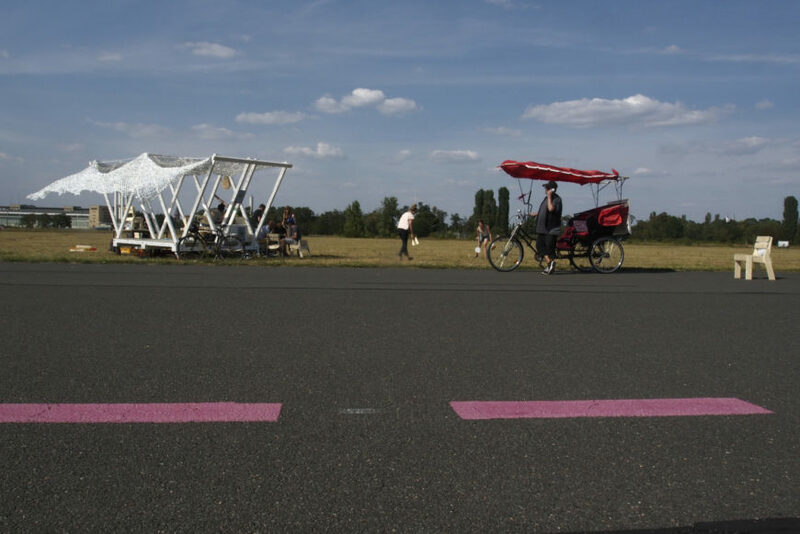 During this experiment, we have realized that if the field is a place for the public and thus a sign for the creativity, spontaneity, and activity of Berlin, the city needs to be able to offer its users, initiatives and fighters place for their dreams. 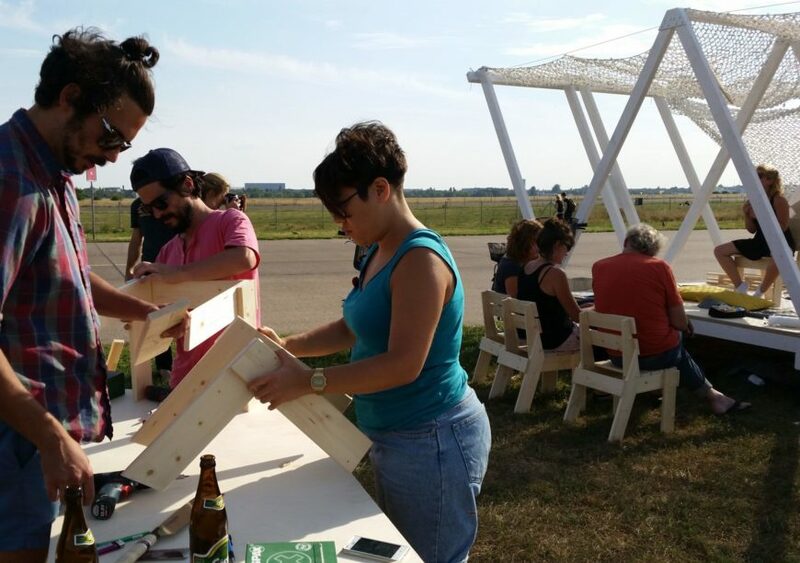 Due to the great outcome of the first workshop, we got invited to build furniture with a refugee camp that is now located inside the hangar. 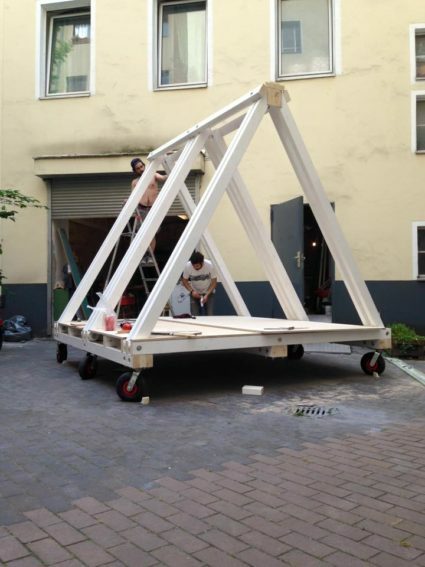 A project by Berk Asal, Dan Dorocic and Anika Neubauer, Sam Carvalho.